It's Dress #2 - What Colour is that Jacket? Do you remember THE DRESS? It was that infamous frock that divided the nation, sparked arguments and caused divorces all over the world. Was it Blue and Black or White and Gold? Well, it’s back! On the first anniversary of the day that the Dress ruled the internet, there is another garment to ponder. Meet THE JACKET! 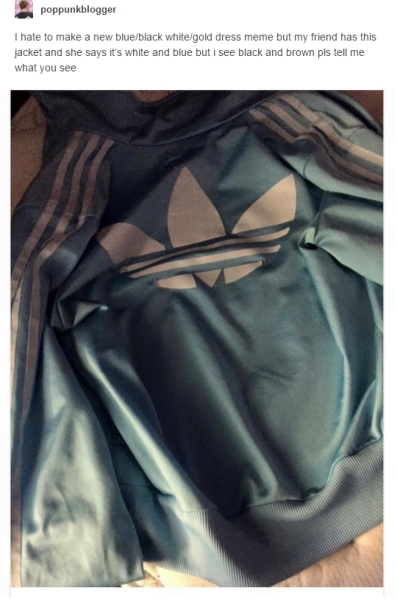 “I hate to make a new blue/black white/gold dress meme but my friend has this jacket and she says it’s white and blue but I see black and brown, please tell me what you see,” she wrote in her post. Of course, the crowds have responded and once again it’s divided! So, what do you see?